You may say that I’m a dreamer… | Where have the days gone? I was excited when I saw that the Pittsburgh Cultural Trust was offering a pair of tickets to Thursday's Joan Baez concert at the Byham, just for being one of the first three people to write on their Facebook wall. And even more excited to see that only one person had done that by the time I found out about it! I hadn't really known all that much about Joan Baez other than that she was an iconic folk and protest singer, but after reading some more about her life, I was so looking forward to the concert. As you can see by the photo, Joan Baez has aged well (I think) into a sort of elder stateswoman of folk. She played and sang for two solid hours, sometimes with the band from her 2008 CD (plus her son Graham on percussion), and alone on stage for a number of songs in the middle of the concert. Her voice has mellowed somewhat at age 68, but she still has her full range and emotion (she mentioned at one point that she works with a voice coach to keep it that way). Between songs, she told stories about Woodstock, Dr King, and setting out mattresses and food for the people camping out in front of her house in the 60's. She sang songs ranging from one from her first album in 1959 (when, she joked, recording was easier when you just sang into the big horn with the black-and-white dog), through to songs written by Elvis Costello and Steve Earle from her latest grammy-nominated album. "Forever Young", which she said she sang at her son's wedding, and also at her parents' second wedding. Can you imagine having Joan Baez sing at your wedding? This one choked me up. Another Dylan song, "Love is Just a Four-Letter Word", which included a verse she sung in Dylan's voice, which was right on. In honor of being in Pittsburgh, she added "Joe Hill", with its theme of organized labor, to the concert. "Christmas in Washington", by Steve Earle, which though written in the mid-90's, gained new meaning as she poured all her emotion into the lyrics, "Come back Woody Guthrie, come back to us now, tear your eyes from Paradise, and rise again somehow…"
An a cappella rendition of "Swing Low, Sweet Chariot", which she sang to Dr King to wake him up one day. She encored with "The Night They Drove Old Dixie Down", absolutely stunning, and then closed by leading the audience in singing John Lennon's "Imagine", my favorite song in the entire world. 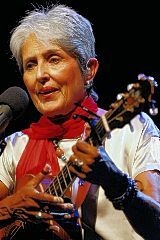 Yes, Joan Baez, you are a dreamer… and throughout your 50-year career, you've seen to it that you're not the only one. Inspiring! She has aged beautifully! Great that she's singing for a charity – that rocks. Some of my favourite songs are listed here! Sounds like a wonderful evening. She looks terrific! How wonderful! She still looks beautiful in that photo. Wow! Now my age is showing – I remember when she headlined Glastonbury festival – must have been 82, maybe 83. They had her playing out on Sunday night, which may not have been the best time for her set. By 11pm on Sunday night, after at least three nights of drug taking, drinking, dancing, singing, mud baths, oh you know, all the festival stuff, Joan Baez just was not what peeps wanted to hear. She was good though, just did not get the respect and response I think she would have got had she opened a stage, rather than closing it.And she sure is looking good.